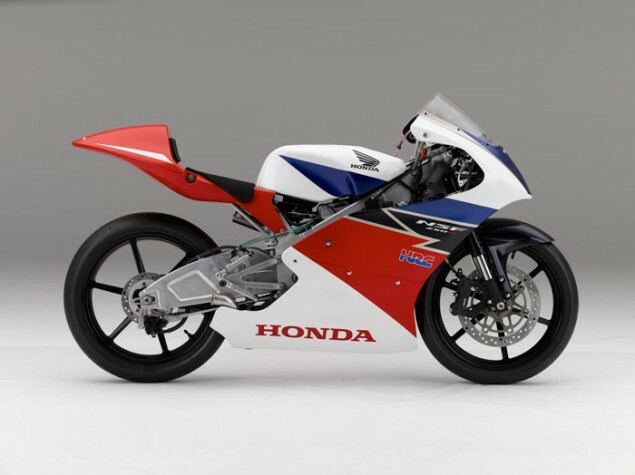 Honda Racing Corporation officially unveiled its NSF250R road racer today at Catalunya ahead of this weekend’s MotoGP round. The four-stroke, single-cylinder motorcycle is scheduled to replace the venerable RS125R in the Moto3 class in 2012, marking the end of two-stroke GP racing which has been around since the series began in 1949. At the heart of Honda's NSF250R is a 249cc DOHC Single with a reverse cylinder, switching its intake to the front while moving the exhaust port to the rear. Titanium valves are being used to reduce friction and maximize output at higher rpm. In order to keep the engine compact and to centralize mass, its cylinder is titled back 15 degrees. Offsetting the cylinder’s centerline and adding a nickel silicon carbide treatment on the cylinder’s surface aim to reduce friction and improve durability. The engine’s balancer shaft has been placed above the crankshaft which helps keep the engine stout and further concentrates its mass. The chassis and geometry of the NSF250 is based off its 125cc predecessor. Its swingarm and frame have been reconfigured to meet the torsional rigidity demands of a four-stroke engine. HRC used riding tests and CAE analysis to calculate frame specifications. The frame was designed with the extra weight of the four-stroke 250 in mind which sits at a claimed 185.2 pounds or 84 kilograms, up from the 125’s maximum weight of 80 kilograms. Tweeks to the chassis should provide stability during braking, too. The close-ratio six-speed gearbox is a stacked cassette design which allows for the gear ratios to be swapped out a little easier to meet the demands of racing at different circuits over the course of a MotoGP season. The basic structure of the suspension is the same as the RS125R. Former 500 GP world champion Alex Criville will complete demo laps on the NSF250R tomorrow and on Sunday before the MotoGP race in Barcelona. Sales of the new road racing motorcycle are planned to start in December 2011. Initial MSRP is 23,600 Euros (U.S. $34,070). HRC’s Executive Vice-President Shuhei Nakamoto and NSF250R Project Development leader Yoshiyuki Kurayoshi of Honda Racing Corporation unveiled the new Moto3 motorcycle at a Montmelo press conference. 34 year period and nurtured a number of racing riders. We have enjoyed much success with RS125R and we hope this new machine will provide a similar story. Dani Pedrosa and Andrea Dovizioso became World Champions riding this bike and our aim is again to give young riders a good racing machine to help them learn the basics and gain experience to one day reach the top class,” Nakamoto said in HRC PR.